Age of Strife :: Rocks and ruined temple Bases. 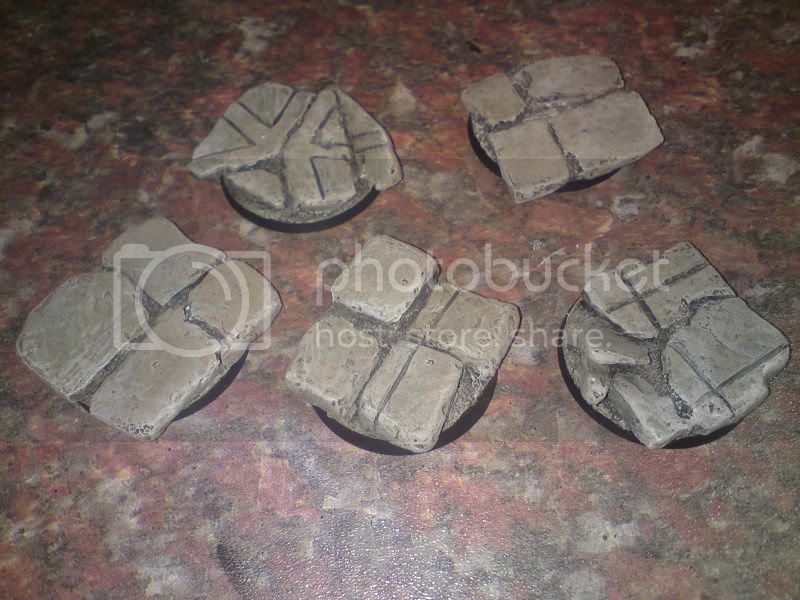 Blog Subject: Rocks and ruined temple Bases. estarriol wrote: one tip if mixing powder polyfilla/tetrion etc. 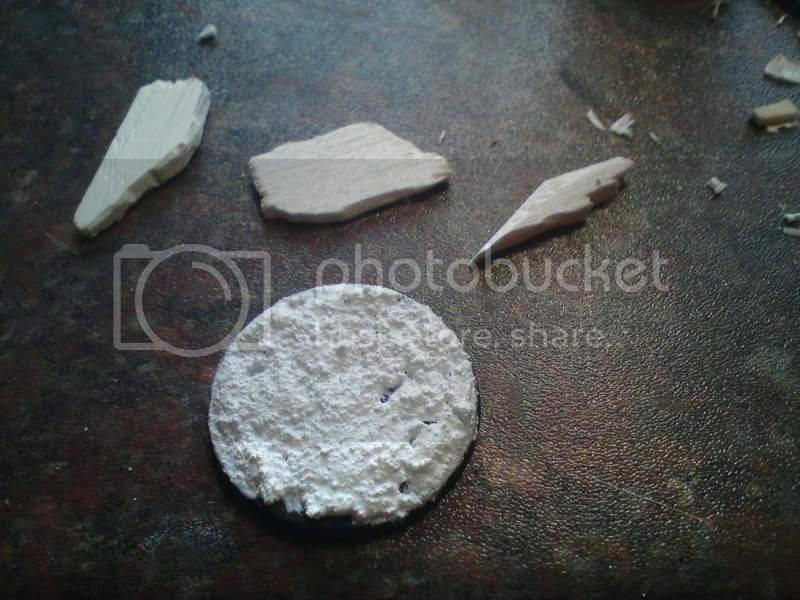 get a tub of watercolour paint powder or cheap acrylic in your base rock colour (so grey, light brown whatever) and mix that in as well, it means that any plaster chips off you don't get a glaring white lump appear. 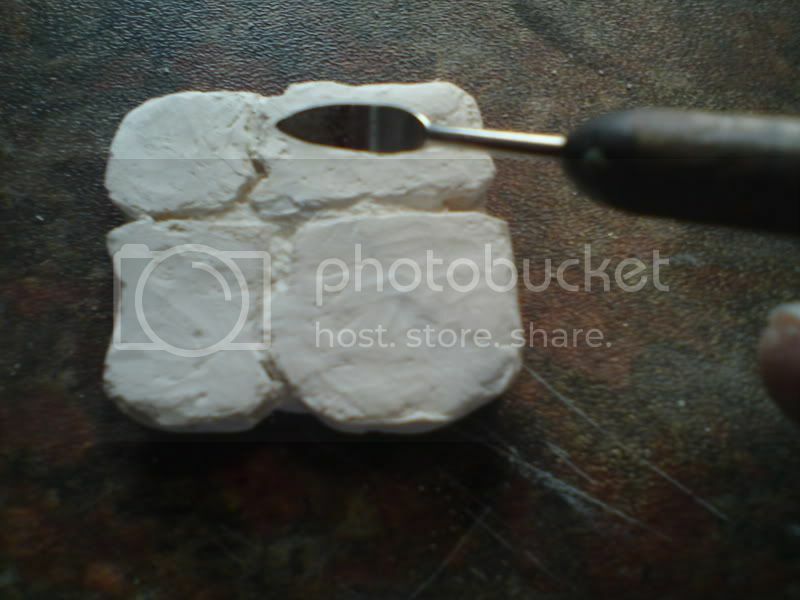 Once set, using a craft knife or sculpting tool, you can trim/sculpt/detail the rock to your preference. Then all that is required is paint. Ok so this is a post I made on B&C ages ago, so some of it will seem like I'm repeating myself. 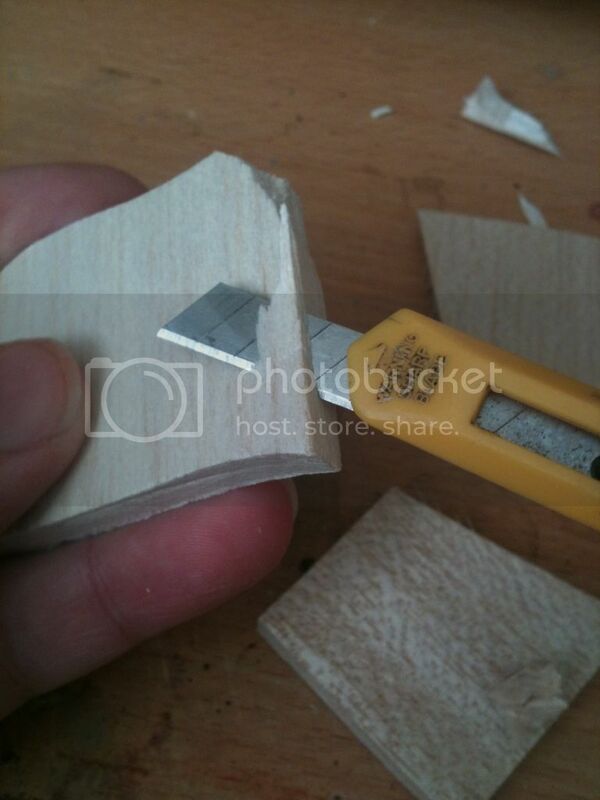 I started by cutting various shapes out of 4mm thick balsa wood. (I also use 3mm, 5mm and 10mm for different depths.) These do not have to be exact, but if you have in mind how you want them to go together, use this as a guide for basic size and shape. 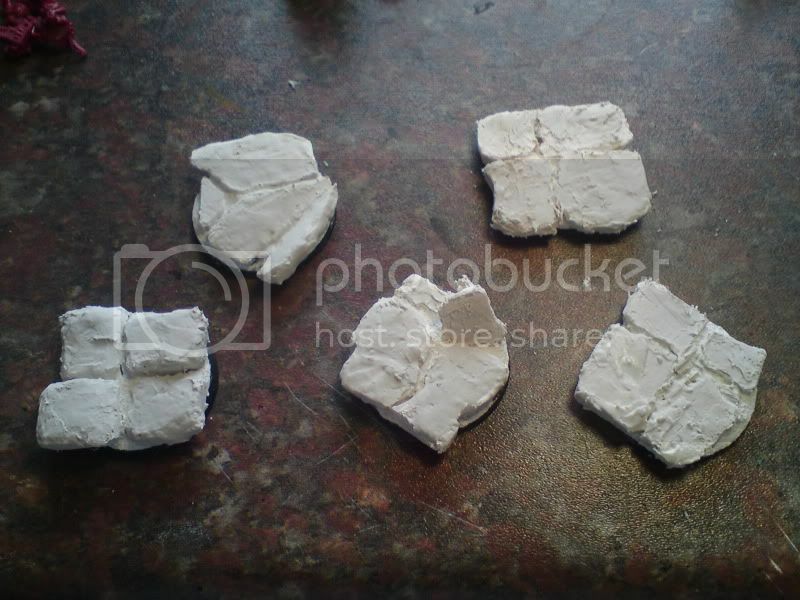 It is important to set the Balsa Wood pieces in place before the PVA:Gravel mix sets because you use this to hold the Balsa Wood in place. Although I try to make them all look like they are ment to be together, I try always to vary the damage etc. This way they don't look mass produced. 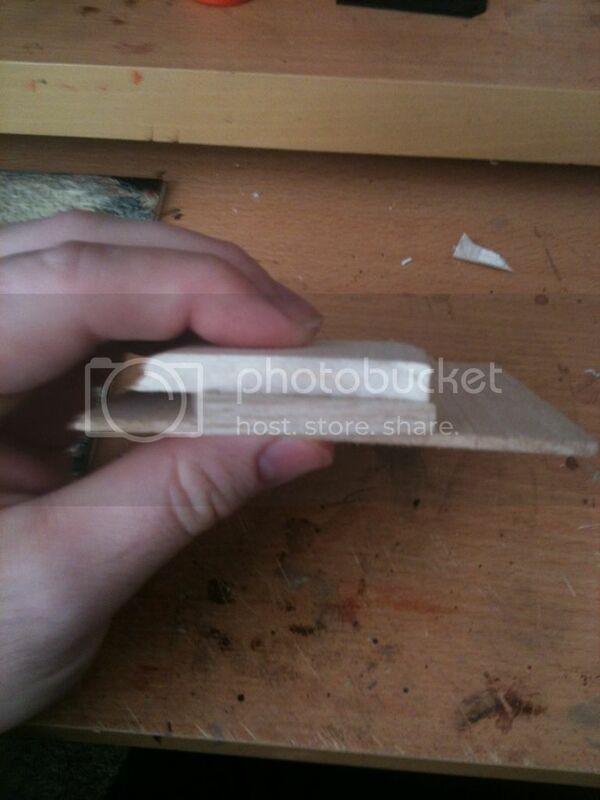 Next, apply Plaster or Filler to all the visible surfaces of the Balsa Wood. 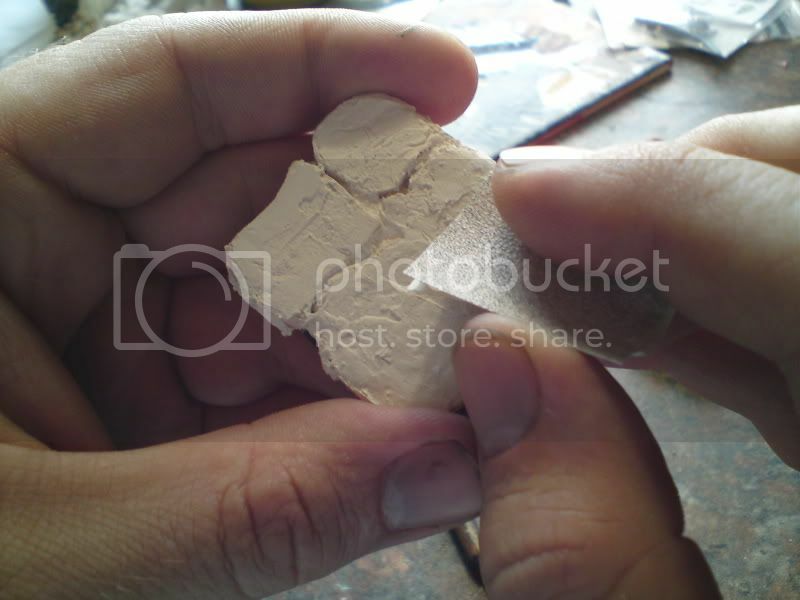 (I use quick drying PolyFilla) Try not to get much or any on the Gravely texture as it will dilute the detail. 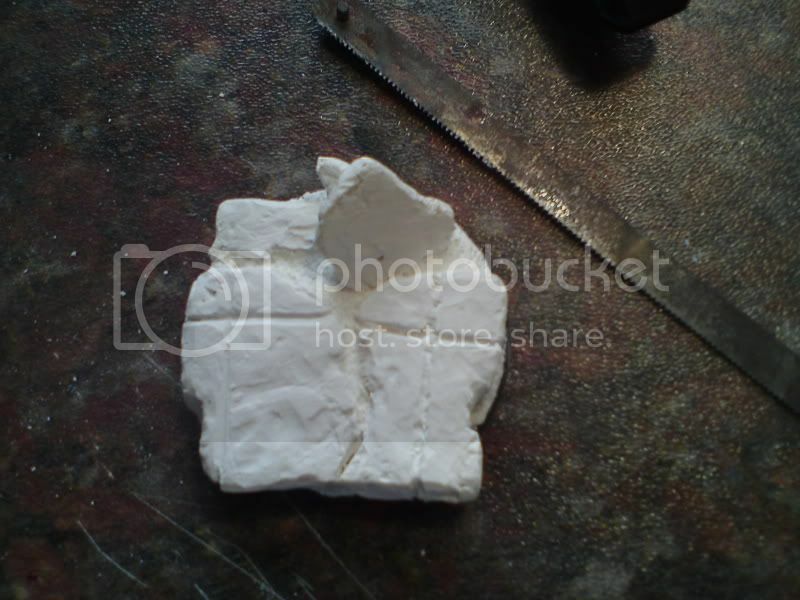 Once the Plaster has dried, smooth it down using a medium sand paper. Do not smooth it off completely because you want it to look warn. 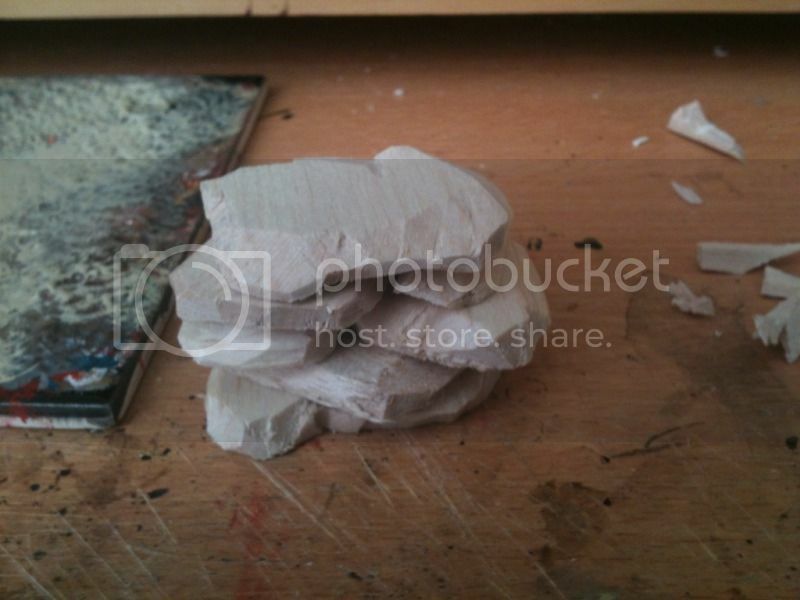 To add to this you can scrape shallow fleks using various sculpting tools. 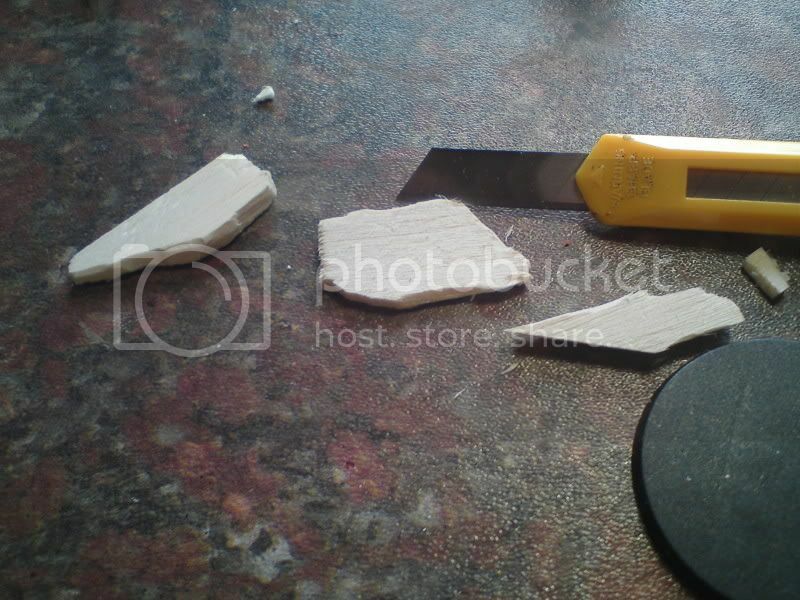 And also to make it look like its paving, you can score lines using a hobby knife or a mini hack saw blade like I did. 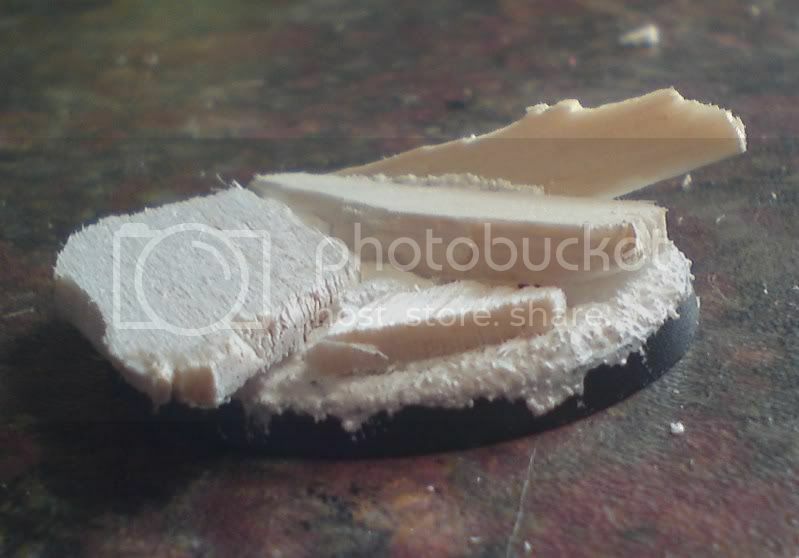 Before painting, I dry fit which ever models I intend to inhabit the bases. I do this to make sure they fit correctly so I don't have to risk altering them later. 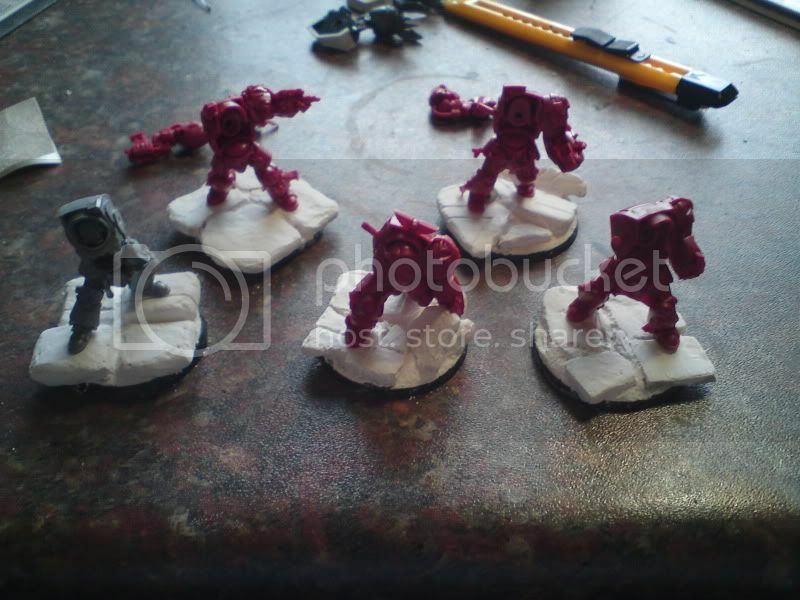 You can paint them in what ever colours suit your needs. My recipy is as follows. Finally highlight of Bleached Bone. Nice tutorial! And very well done bases. Yes, this does help because the techniques can be used for more than just bases. Cool I'm glad you liked it! Excellent tutorial, couple of assitional tips/ideas. 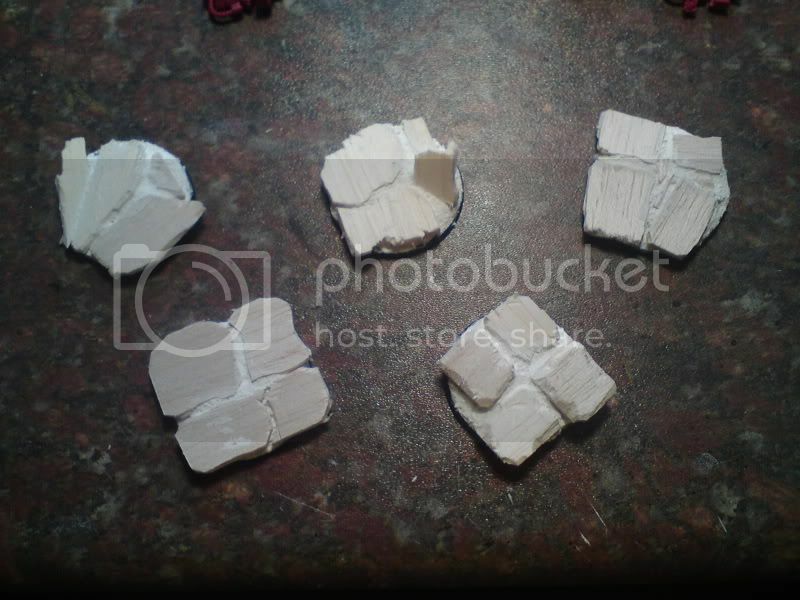 Firstly if I want a coarse texture i find Tetrion better than Polyfilla, secondly for the wood bits, if you live in the right area and can find an old slate tile, that shards and breaks up excellently with the application of a hammer and gives food stone flakes to use as scree as well for the base of the cliff. Cool, but a couple questions. 2) Won't the stone/slate make it heavier? Tetrion is an all purpose filler, like polyfilla, so your DIY shed etc. 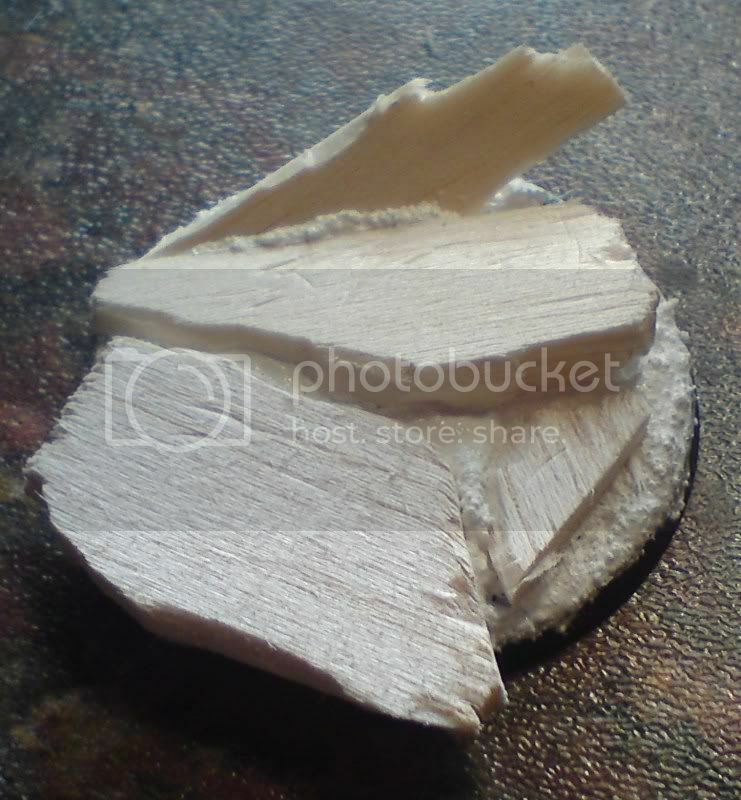 The extra weight of slate is useful on bases as it puts weight to the bottom of a model, solesslikelytofallover,andinterrinaslongas it is not overdone, agin adds a solidness, just bals and foam doesn't have.